Traditional dynamic processors (compressors, expanders, gates...) detect levels of input samples and transform them depending on the transfer curve. This means that the gain is changing on every sample. This can be very well used to shape the sound itself, but it is hard to make it transparent if you want to level individual drum hits. MDrumLeveler on the other hand analyzes the incoming audio, detects events (drum hits for example) in it and transforms them somehow. That way it adjusts the level of each event, but does not alter the actual sound or color, so the results are unbelievably transparent. No drummer's performance is perfect, each hit has a different velocity, and difference in levels are even exaggerated by the recording equipment. But there is a very high standard for perfectness in performances for most modern styles. Vocalists regularly use automatic tuner, drummers have MDrumLeveler now. It can even out drum hit levels, so the performance will just sound perfect even if it, well, is not. Traditionally you use gates to attenuate the audio in between separate hits in order to remove ambience and leakage from other instruments. That is necessary for modern tight mixes and very hard to accomplish with standard tools. MDrumLeveler can do it with unbelievable ease and provides unbelievable results thanks to the advanced event-based processing. 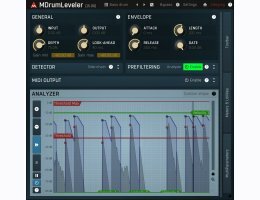 MDrumLeveler lets you shape the envelope of each drum hit. Whether you want a longer body or faster release, it is no problem for MDrumLeveler. And you don't need to spend hours experimenting, MDrumLeveler gives you a direct control of these parameters. 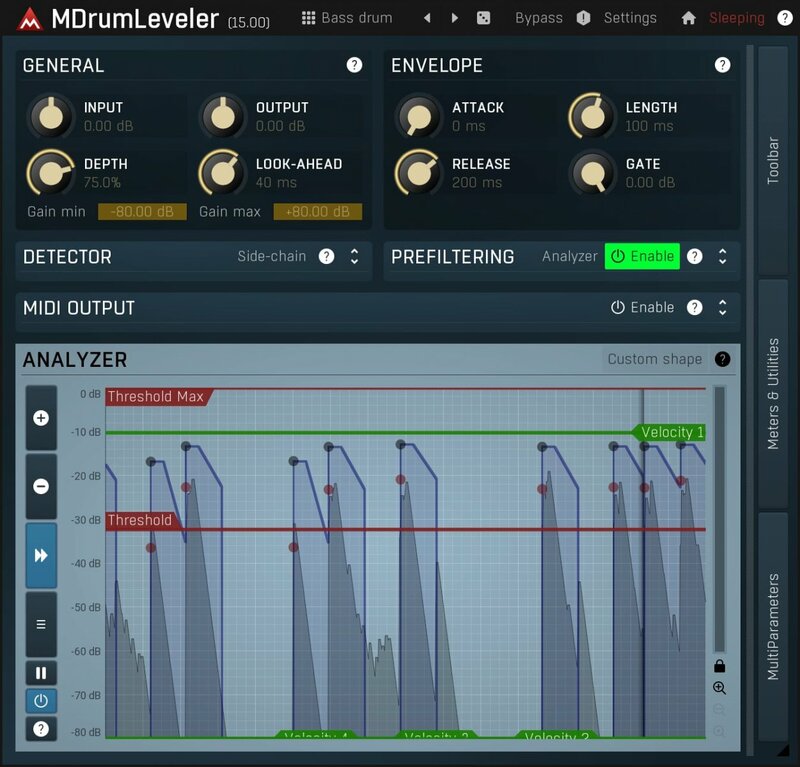 Drum recordings are rarely flawless, usually contain lots of leakage, ambience, artifacts... MDrumLeveler's event detector is highly adjustable. Among other settings, you can use 2 parallel resonant band-pass filters to target the dominant frequencies of the drum you are interested in. MDrumLeveler's job cannot be done without looking "into the future". By default it looks 20ms ahead, which provides 100% accuracy for all standard drums. But you can get much lower - in most cases look-ahead below 5ms still works perfectly, good enough for using it live. MDrumLeveler can know how hard you hit the drum just a few milliseconds after you do that.